A bookmark (or linkblog) is a post that is primarily comprised of a URL, often title text from that URL, sometimes optional text describing, tagging, or quoting from its contents. To post a bookmark, the post's h-entry must have a property u-bookmark-of with the URL you are bookmarking. The trailing preposition "of" helps communicate this in the same way that we have u-in-reply-to instead of u-reply. IndieNews is an aggregator where you can submit posts via Webmention. You can either submit your own posts by adding a u-syndication link from your post to IndieNews, or you can submit other posts by making a bookmark post on your site and submitting that. For direct submissions, IndieNews displays the name of the post and the domain name of the site (see bottom post in screenshot). For submissions of bookmarks, IndieNews displays the name and domain of the bookmarked post as if it were posted directly, and indicates that it was "submitted from" the domain of the person who submitted it. (see above post in screenshot). There are some emerging patterns for how people POSSE bookmark posts in particular. Similar to POSSEd post types like jam and read one could prepend POSSE posts to Twitter with an 🔖 emoji to indicate the post type. Rather than simply posting a title and a URL, the emoji could help to indicate that a bookmarked post hasn't (necessarily) been read by the poster. Emoji use on Twitter is particularly effective as the platform limits the number of characters to indicate sentiment. One can also take advantage of the concept of Twitter cards to shoehorn additional information from the post into the tweet (though this is only displayed on some twitter clients/outlets). A number of individuals POSSE bookmarks explicitly to a different Twitter account than their "normal" or "primary" one. Aaron Parecki previously used WordPress to post bookmarks on aaron.pk/bookmarks using a custom Wordpress post type since 2010-12-18. He now uses Quill to post bookmarks to p3k as of 2014-09-07. User:atomicules.co.uk, taking a slightly different approach, I decided I did not want to host or own every bookmark I make as I would never have a self-hosted tool as quick and as convenient as Pinboard, etc, nor did I want the clutter of bookmarks offtopic to that of my website. I did, however, already have link type posts, so I decided to start syndicating these out to Pinboard (See that page for my example). At IndieWebCamp NYC2, attendee Larry Kooper demoed a bookmark site he built. The code is available on Github. I also have an optional workflow using PressForward that not only includes the above, but which can scrape the content of the page via the Mercury API to make an archival copy on my site if I wish. I also use Post Archival to trigger an archival copy to the Internet Archive as well. POSSE copies are often sent to Twitter, usually with a bookmark emoji as described above and other optional services like Mendeley, diigo, delicious, scoop.it, flipboard, stubleupon, and others as appropriate. See this link for more Thoughts on linkblogs, bookmarks, reads, likes, favorites, follows, and related links. Amy Guy stores bookmarks in sloph as ActivityStreams 2.0 Add activities to the Bookmarks collection, visible at rhiaro.co.uk/bookmarks/. Sebastiaan Andeweg posts bookmarks as of 2016-11-20, showing the text 'Seb heeft [title] door [author] gebookmarkt.' with a bookmark-icon. No quotes. Similar as a like (with a heart icon), but for more serious articles, meaning 'interesting' or 'please also read this' and in some cases 'want to read' or 'want to read again later'. I realised (on 2017-08-06) that I bookmarked something twice. They ment more "I want to read this" than "please read this too". Thinking about changing how I use them, more into an archive of interesting articles, with categories and notes, to revisit and actually add value to the post. 2016/Brighton/indiebookmarks Bookmark Workflow was a session at IndieWebCamp Brighton 2016. 2017/Berlin/bookmarks Bookmarks & Archiving was a session at IndieWebCamp Berlin 2017. Wallabag, while technically more of a read later type of service, it could be bent to be used as a self-hosted bookmarklet service. The below image is of the bookmark display on Pinboard, which adopts a text-first somewhat minimalist design which shows the name, when it was bookmarked, and by whom. A description and tags can be optionally added. While in late 2016, it appears that delicious is making an attempt at a comeback, it doesn't have the ability to export anymore. Those interested in a separate export functionality may appreciate Szafranek's Delicious Exporter. 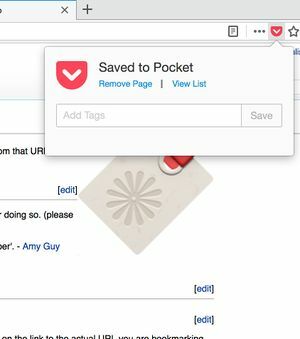 Pocket has integration with Mozilla's Firefox browser. In version 57, a Pocket-icon appears in the address-bar. When clicked upon, it shows a little popup with 'Saving...' and then 'Saved to Pocket', with links to remove the bookmark or view the list. It is also possible to add comma separated tags to the bookmark. The reading list 'My List' contains all your bookmarked pages. When you hover over an item, it gives you options to share, archive, delete, re-tag, or favorite the item. Clicking the check-mark archives the item and removes it from the list and adds it to archive, so you can keep track of what you have read and what you haven't. Pocket removes double entries: if you save a page twice (by accident?) it won't save it twice on your list. If you marked it as read, however, it will appear as unread in your reading list. Text of a bookmark post is most often the title of the linked resource, i.e. created by the author of the linked resource, rather than the person posting the bookmark post. This is a key distinction between a bookmark and other kinds of posts. The text of a reply is written by the person posting the reply, and often a new statement in response to the original post. If the text of a bookmark post is written as commentary on the bookmark, then that should likely be a reply post instead. The text of a repost comes from the entirety of the content of a bookmark rather than the name or title of the bookmarked resource. If the text of a bookmark post is the entirety of the contents of the thing that is bookmarked, then that should likely be a repost instead. The text of a quotation comes from part of the content of a bookmark rather than the name or title of the bookmarked resource. If the text of a bookmark post is merely part of the contents of the thing that is bookmarked, then that should likely be a quotation instead. There is a relatively strong semantic difference between a like and a bookmark, but as a result of the inflexibility of many silos which support likes and do not have explicit bookmark functionality, the definition of a like can sometimes morph so that people in the wild will treat likes as bookmarks instead. Services like IFTTT can also reinforce these patterns via API by taking like/favorite inputs and easily converting them to bookmarks on services like Pocket and Instapaper (or even one's own website). On Twitter many people often use the like (or previously favorite) functionality (or sometimes even repost) to indicate a bookmark. "Like a notebook? Let the author know by clicking the like button in the top-right corner of the page! Liking a notebook also helps you find it again quickly by browsing your likes. In the future, we’ll use likes to help you find interesting and delightful notebooks. This page was last edited on 20 April 2019, at 08:32.